The Apollo computer system made great demands on the crew. It took about 10,500 keystrokes to complete a lunar mission; not much in the life of an airline reservations clerk but still indicative of how computer centered the crew had to be144. During the period in which the software was criticized for its complexity, designers attempted to reduce the number of keystrokes required to execute various programs. When possible, they also eliminated built-in halts as data were displayed for astronaut approval. However, the "fourth crew member" never abandoned center stage145. 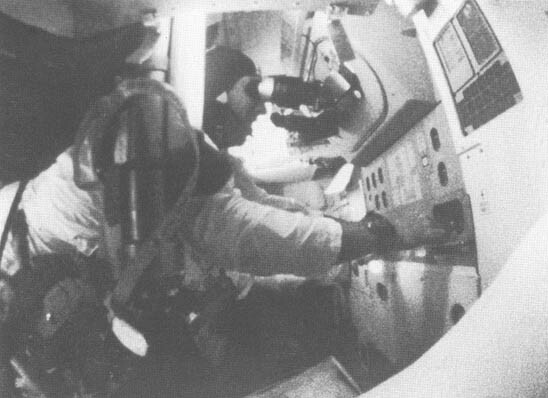 Apollo's crew employed its computer through the use of the DSKYs. In the CM one was on the main control panel opposite the commander's couch. The other was at the navigator's station in the lower equipment bay, where the computer itself was located. Block I had a different DSKY at the navigator's station than on the main panel146, but they were identical in the Block II series. DSKY and computer activity could be monitored from the ground as the computer transmitted data words to drive real-time displays in Mission Control147. The crew could communicate with the computer through keys, displays, and warning lights on the DSKY. Additionally, the uplink telemetry could provide input to the machine, and so could the preflight checkout equipment148. 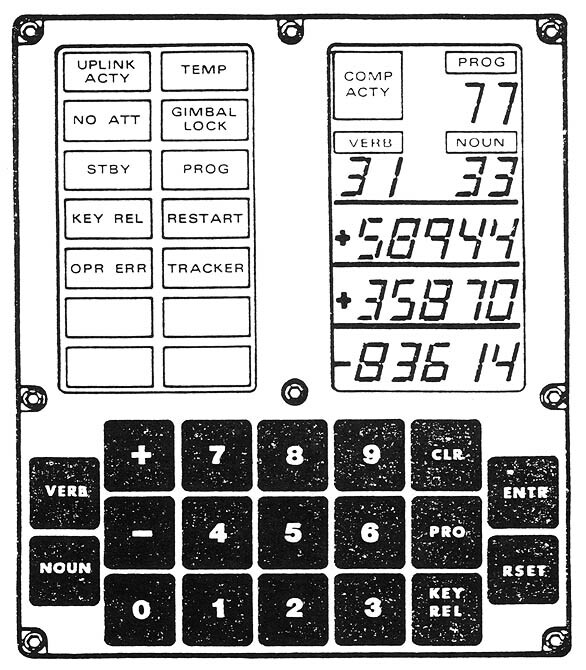 The computer, in turn, could communicate with the crew by flashing the PROGram, VERB, and NOUN displays149. The DSKY displays included 10 warning lights, a computer activity light, a PROGram display, VERB and NOUN displays, three five-digit numeric displays with signs, and 19 keys including VERB, NOUN, CLEAR, KEY RELEASE, PROCEED, RESET, ENTER, PLUS, MINUS, and the digits 0-9. See Boxes 2-2 and 2-3 for functions and use. COMP ACTY: This lit up when the computer was turning a program. UPLINK ACTY: Lit when data was being received from the ground. TEMP: Lit when the temperature of the stable platform was out of tolerance. NO ATT: Lit when the inertial subsystem could not provide attitude reference. GIMBAL LOCK: Lit when the middle gimbal angle was greater than 70 degrees. STBY: Lit when the computer system was on standby. PROG: Lit when the computer was waiting for additional information to be entered by the crew to complete the program. KEY REL: Lit when the computer needed control of the DSKY to complete a program. Sometimes display information could be "buried" under other routines or by a priority interrupt. The crew could press the KEY REL key to release the keyboard to the requesting program150. When the KEY REL light went on, that signaled the crew to press the key. RESTART: Lit when the computer was in the restart program. This was the light that kept coming on during the Apollo11 landing. OPR ERR: Lit when the computer detected an error on the keyboard. TRACKER: Lit when one of the optical coupling units failed. The LEM DSKY had three additional lights: NO DAP, ALT, and VEL, which were related to failures of the digital autopilot and to warn of altitude and velocity readings outside of the predetermined limits. PROG: This was a two-digit display indicating what numbered program the computer was currently executing. VERB: A two-digit display of the verb number being entered (the verb-noun system is discussed below). NOUN: A two-digit display of the noun number being entered. Three five-digit numeric displays, which showed numbers in either decimal or octal (base eight). When a sign was shown with the number, the number was decimal; otherwise, it was octal151. Astronauts used keys to enter information and select programs and actions. Key inputs caused automatic interrupts in the software152. 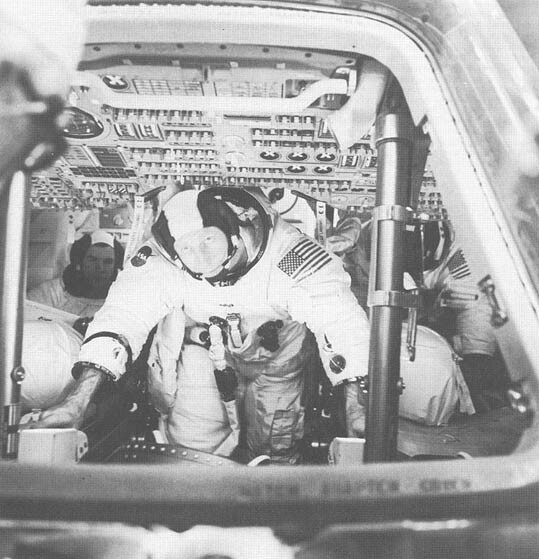 The astronauts would activate a program and then interact with it by requesting and entering information; a typical software load consisted of about 40 programs and 30 simultaneous routines153. Changing programs and making other requests involved using the verb-noun system. Those familiar with current computer keyboards  will notice the lack of alphabet keys on the DSKY. Whereas most computer commands are entered by typing in the text of the command, the Apollo computer command list specified verb and noun pairs. There were 100 two-digit numbers available for each, and most were used on any given flight. Examples of verb-noun pairs are "display velocity" and "load angle." Verb 37, for example, was "Change Prog," which enabled the crew to set up a new program for execution. If, for example, the crew wanted to execute the rendezvous targeting program, an astronaut would first press the VERB key followed by the digits 3 and 7, and then the ENTER key. That sequence informed the computer of a request for a program change. The astronaut would then press 3, 1, and ENTER to tell the computer to execute program P31. Within the program the crew could request maneuver angles (verb 50, noun 18), monitor the changes while a maneuver was in progress (verb 06, noun 18), or request the velocity change required for the next maneuver (verb 06, noun 84), among other functions. The CSM G&C Checklist, a set of "cue cards" on three rings changed for each mission by the Crew Procedures Division in Houston, described all these sequences in detail. The document contained reference data, such as a star list, verb list, noun list, alarm codes, error handling and recovery, and the checklists for each program carried in the computer. Despite the 100 verb-noun pairs, 70-odd programs and routines, and a very limited user interface that alternated decimal and octal and blinked for attention, the consensus is that the Apollo computer was easy to use. As with other aspects of flying space missions, hours in simulators made operating the computer second nature. NASA engineer John R. Garman commented that "it's like playing the piano-- you don't have to see your fingers to know where they are"154. Familiarity with the computer, remarked astronaut Eugene Cernan, meant that pressing a wrong key simply and immediately "felt" wrong155. Others also confirmed that using the machine eventually became relatively natural156. Apollo astronauts were also willing to adapt to design foibles that would frustrate others. There were concerns that a crewman initiating a maneuver from the navigator's station would not be able to return to his couch before the burn started. In response, Virgil Grissom was accommodating: "Well, we'll just lie down on the floor"157. Astronauts also tolerated non-life-threatening software errors not cleared up before flight as merely something else to endure158. They did, however, complain about the annoying number of keystrokes required during a rendezvous, so designers modified the software to make a "minkey" (minimum keystroke) option available, in which the computer could perform some functions without constant crew approval159. This change contributed to an even more compact, straightforward system.